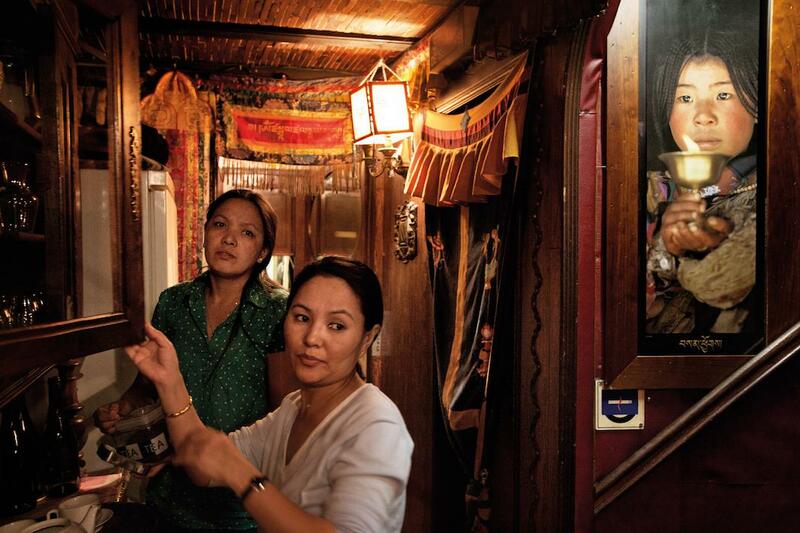 Albertina d’Urso photographs Tibetan refugees in her book, Out of Tibet. Yangchen Lhamo, who came from India in 2001, at work with her colleague at Gang Seng, a specialty Tibetan restaurant in Paris. The Tibetan owner, Tenzin, originally from Kham, took refuge in France and now runs the popular restaurant. Italian photographer Albertina d’Urso went to Tibet for the first time in 2000, eager to experience firsthand a culture she’d only read about in books. The encounter was not what she’d expected. “Once I arrived there I could see that even though the beautiful nature and architecture were still quite unspoiled, people were scared to speak. They were even afraid to answer a simple question like ‘Are you Buddhist?’ Of course no one ever talked about the Dalai Lama, as saying his name can lead you to prison,” she said. A few years later, when visiting a camp for Tibetan refugees in Bylakuppe, India, d’Urso had an entirely different experience. Though far from their homeland, the Tibetans she met could freely practice their religion and speak about their beliefs. In the diaspora, d’Urso realized, Tibetan culture thrived, and she became determined to see the full extent of that phenomenon herself. After Bylakuppe, she made trips to document Tibetan refugees in North India and Nepal. Then, upon witnessing a Tibetan demonstration in New York, she began photographing refugees in North America and Europe. Photographs from 10 years spent at celebrations, demonstrations, and in the homes of refugees are now collected in a book, Out of Tibet, which Dewi Lewis published this month. “I realized that they consider themselves as a real ‘country’ even if they are spread all around the world. So I felt the need to unite them visually. I thought that my project was like giving them a ‘land’ where they could all be together,” she said via email. 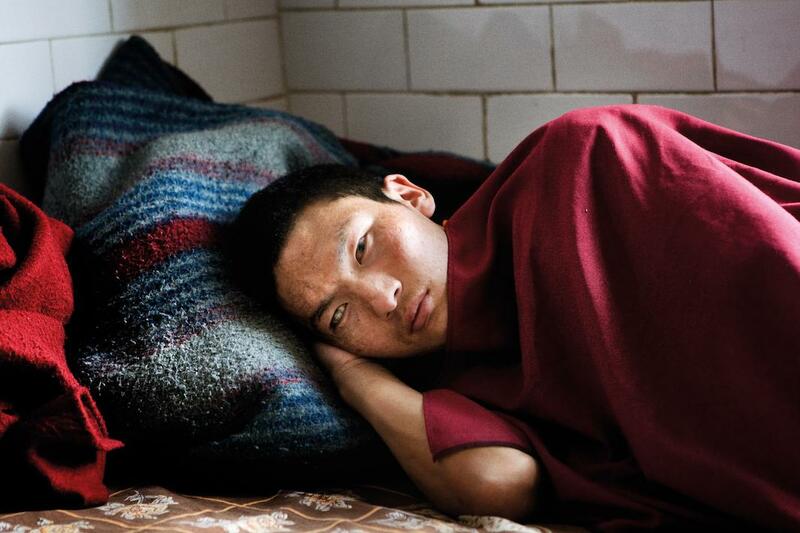 Tsering Phuntsok, a monk who escaped from Tibet after the 2008 uprising, rests in Dharamsala, India, at the McLeod Ganj reception center for exiled Tibetans. Like most of the refugees who escaped from their homeland, Phuntsok, 19, crossed the hazardous terrain of the Himalayas mainly at night and slept in caves. During the journey the extreme climatic conditions caused him to lose his eyesight. 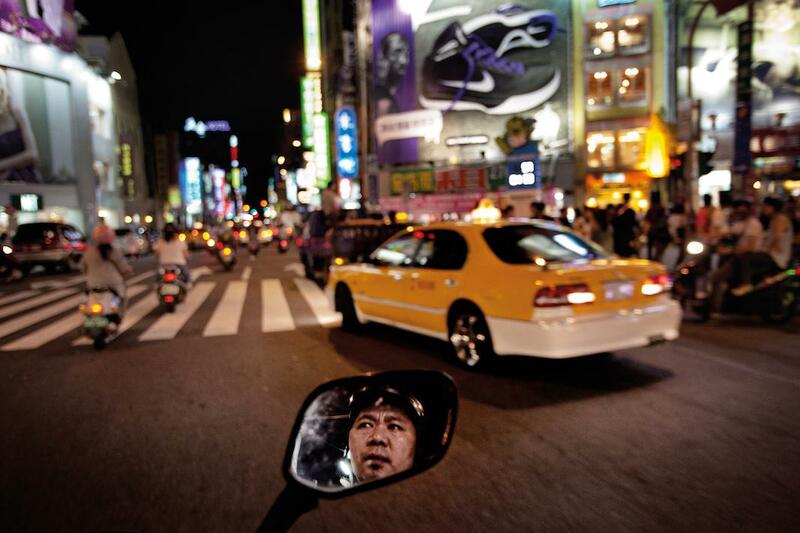 Samten Dorjee, an exiled Tibetan, rides his motorbike through the busy streets of Taipei, Taiwan. Born in India, Samten has been in Taiwan for more than a decade. Commemoration of the 53rd anniversary of Tibetan National Uprising Day, March 2012, in Rome. 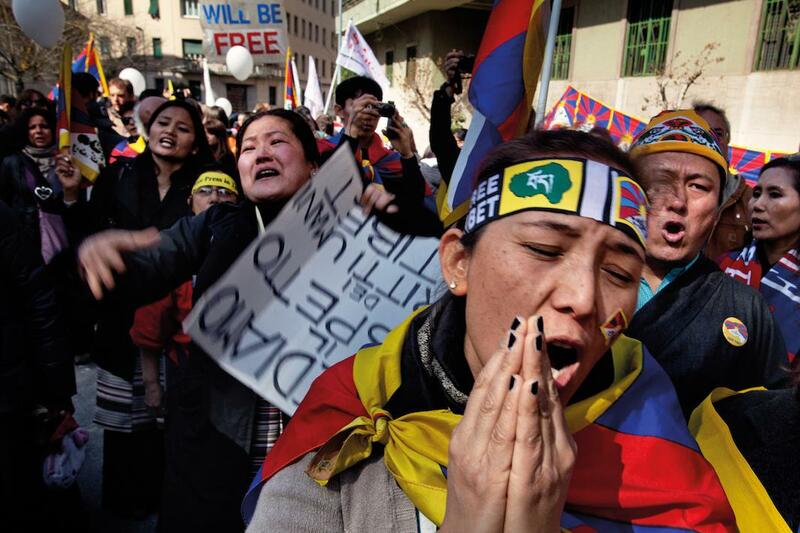 Tibetan refugees and their supporters shout slogans of freedom and wave their national flag in front of the Chinese Embassy. 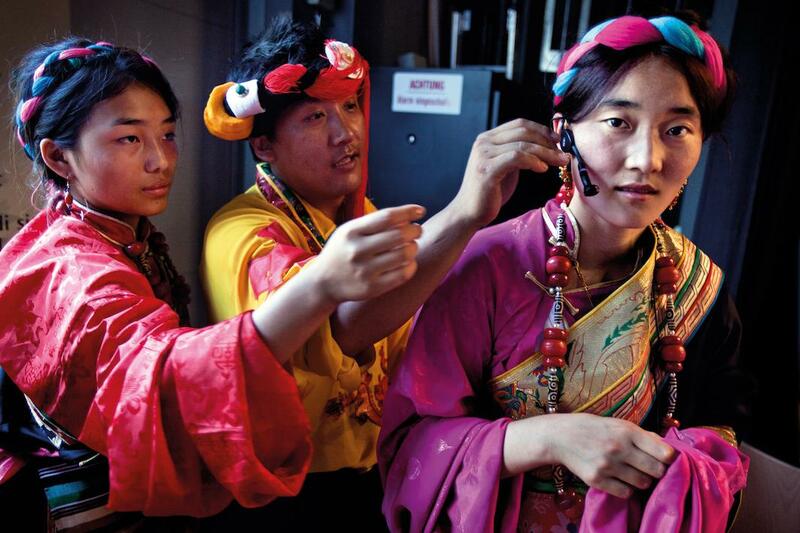 Tibetan performing artists in traditional costume back stage in Bulach Stadthalle at an event to celebrate the 75th birthday of the Dalai Lama in Zurich. There are more than 100,000 Tibetan refugees living around the world, and their experiences vary greatly depending on when they left Tibet and where they settled. D’Urso’s photographs recognize those differences, but they serve primarily to highlight the ties that bind the far-flung community. “In their private moments they always practice and honor their beliefs. All their houses are decorated in a traditional way with altars; Tibetan flags; and photos of the Dalai Lama, Potala Palace, and Tibetan relatives. Houses in New York, London, or Paris, once you step inside, look like houses in Bylacuppe or Dharamsala,” she said. 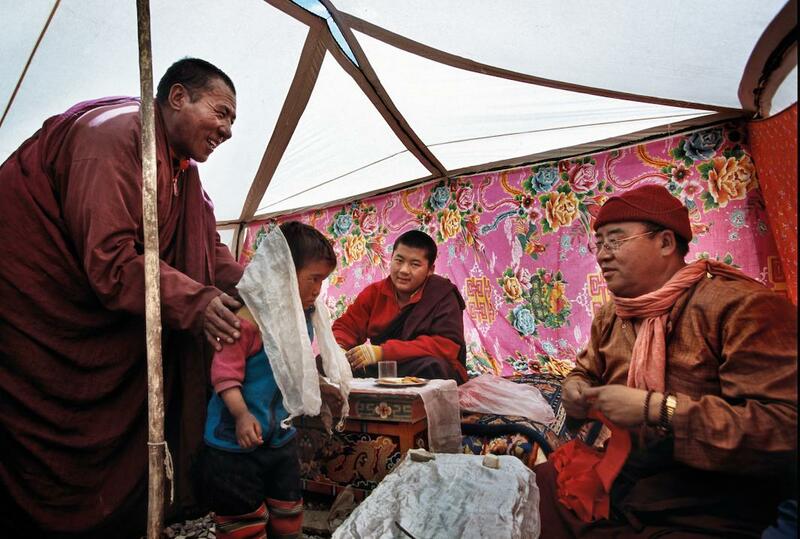 An incarnate Rinpoche in his tent in the Rupsu Valley in Ladakh, India, blesses a nomadic Tibetan child. Exiled Tibetans, Dolma (right) and her friend Pema (left) practice their English together in London. 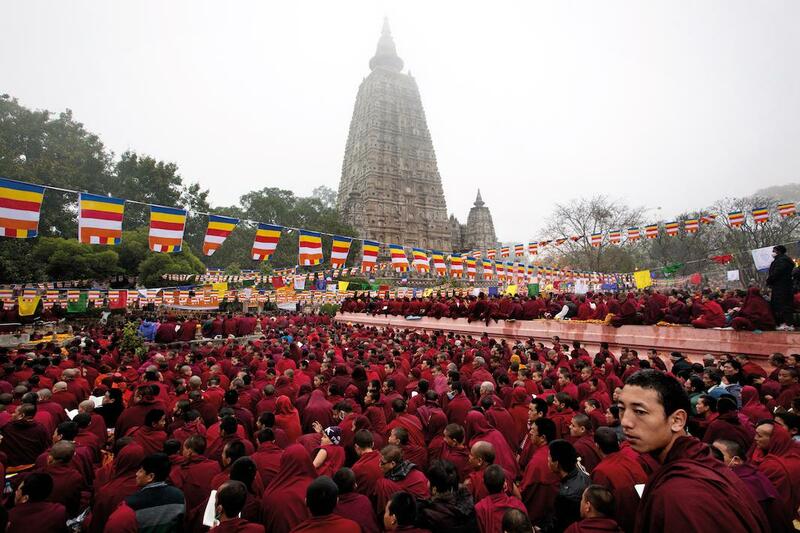 Thousands of monks gather during the 2012 Kalachakra prayers in front of the Mahabodhi Temple in Bihar, India, where the Buddha is said to have attained enlightenment under the Bodhi Tree more than 2,500 years ago. 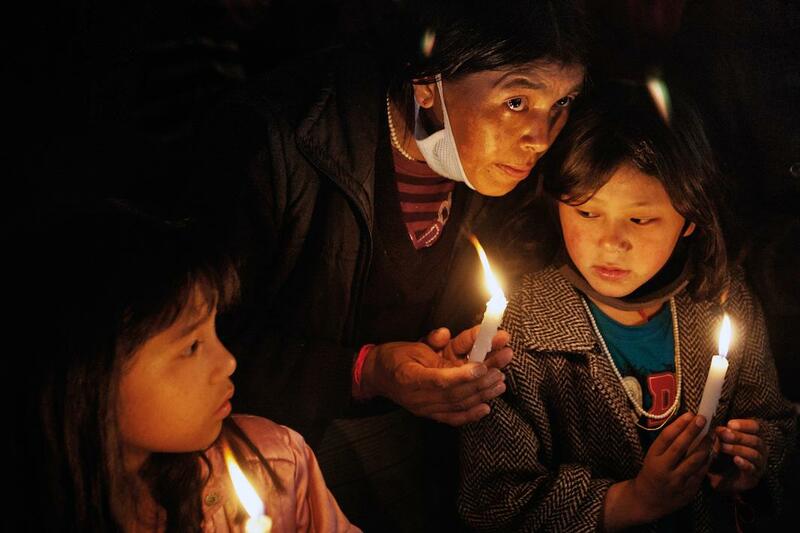 A Tibetan woman at Bodh Gaya in Bihar, India with her two children during a candlelit vigil to mourn and honor Tibetans who have carried out self-immolation to protest the Chinese occupation.